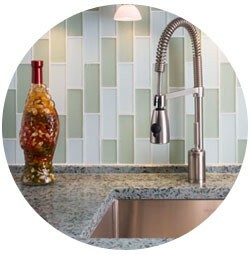 Floor tile, wall tile, mosaics and decorative tile - we offer a broad array of products. In addition to its visual appeal, tile will not absorb odors or support bacteria, thus making it appropriate for kitchens and bathrooms as well as great rooms, sun rooms and foyers. Let us help you pick the right blend of color, style and size to express your individuality. Tile, often referred to as "ceramic" tile may be ceramic or porcelain. Ceramic tile is made of primarily clay therefore it is porous. The ceramic tile is then glazed giving it different designs. 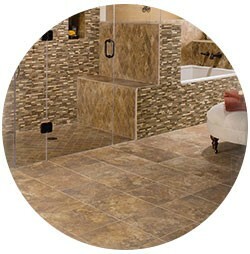 Ceramic tile is very durable and will not absorb odors making it a great choice for flooring in many areas of the home. Porcelain is made of finely ground sand. The process of making the porcelain involves pressure and extreme heat therefore, porcelain is a very dense almost glass like product. Porcelain like ceramic is very durable and comes in many different designs making it a great choice for floors and walls. Porcelain is stronger than ceramic and will not chip or break as easily. However, proper installation will ensure a longer life for either product.